Over the past several months aging and power hungry light fixtures throughout the Anthropology and Archaeology Gallery have been replaced with more efficient and energy friendly fiber-optics and LEDs. These efforts have resulted in the reduction in electricity consumption from 92,800 kilowatt hours to 1,400 kilowatt hours over the lifetime of the fixtures. The cost savings are estimated to be roughly a thousand dollars per year and over $15,000 over their lifetime. The necessary electronics fabrication expertise was provided by the State Museum’s own A/V guru, Alan Byler. Kudos to Alan for his LED solutions in the Culture History Dioramas. In addition to the reduced electricity consumption, the recycling of two mannequins from the Mastodon exhibit to the Delaware Indian Village has contributed to cost savings. With the Mastodon exhibit on the third floor undergoing major renovations, the Section of Archaeology has made good use of two mannequins in the village exhibit. Instead of wasting the figures by tossing them into the dumpster they’ve been incorporated into the village life scenes. With the help of exhibits fabricator Jonathan Schreffler, one figure has been transformed from cringing in front of a Pleistocene pachyderm to a more routine activity of 16th century Delaware life, scraping a deer hide in preparation for use as clothing. Also, a toddler girl was refurbished and added to the village, contributing some childhood energy to the overall scene. Thanks to Jonathan’s skills, this creative re-use of exhibit materials is not only a major cost savings, but also an aesthetic success. Look for more energy aware and carbon conscience enhancements to the galleries in the future as the The State Museum continues to interpret and exhibit our shared heritage of the Commonwealth of Pennsylvania. This week's guest blogger Lyn Nardello, a rising senior at Franklin & Marshall College. Lyn is an American Studies major with an interest in preservation planning. This summer she's interning with the Pennsylvania's Historical and Museum Commission in the Bureau for Historic Preservation to develop and approach to effectively link community-based preservation planning with transportation planning. When severe flooding in the summer of 2006 washed out four bridges in Luzerne and Wayne counties, these bridges were given emergency priority for replacement. 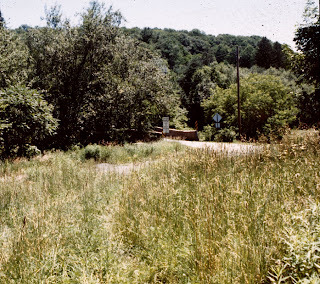 The APE, or area of potential effect, of one of the bridges—a concrete bridge that crosses over the West Branch of the Lackawaxen River in Wayne County—included a total area of .93 acres. Buildings in the area include a circa 1850 house, which lies just outside of the APE, a circa 1850 bank barn, circa 1920 abandoned poultry shed, and a circa 1950 barn. Historic properties such as this are oftentimes rich in cultural resources, and despite the fact that a relatively small part of the site lies within the APE and was determined not eligible for listing in the National Register of Historic Places, extensive background research and site surveys were conducted on the property in accordance with federal and state laws intended to safeguard important cultural resources. Background research revealed the long and interesting history of the house and farm on the Eldred Site. A deed shows the area was originally surveyed by a man named Thomas Craig around 1811, but the farm was established in the mid-19th century by Judge Nathaniel Baily Eldred. A native of New York State, Eldred made quite a life for himself in Pennsylvania where he was elected to State Legislature and served for four years between 1822 and 1827. He was subsequently appointed to several important positions: Commissioner of the Milford & Owego Turnpike; president judge of the Eighteenth Judicial District and later of the Sixth Judicial District; and naval officer in the Philadelphia Customs House. He served a term as Canal Commissioner and was a member of the Board of Commissioners overseeing navigation of the Delaware River. He declined a nomination to the Supreme Court in 1851. Additionally, a township in Jefferson County was named in his honor. Upon retiring and settling fulltime at his dwelling in Bethany Borough, Eldred and his wife conveyed the Eldred Farm to a man named Justus Sears who then sold it to German immigrant George Fogel by 1860. Fogel ran the 130-acre general farm on the site for a short time before assigning the property to Joseph Gerher. Over the next several years the property was assigned to William W. Sherwood and then to Henry Greiner, a Civil War veteran who had lived the life of a farmer before enlisting in Company H of the Fifty-Second Regiment Pennsylvania Volunteer Infantry in 1861. He participated in 1862 battles at Lee’s Mills in April; Seven Pines and Fair Oaks in May, Bottom Ridge and White Oaks Swamp in June, and Carter’s Hill in July. After the war Greiner owned and operated the Eldred Farm with his wife and two daughters for seventeen years before conveying it to James P. O’Neill and his wife Mary, but these new owners maintained their residence in Mount Pleasant Township and conveyed the Eldred property to a Pennsylvania-born farmer named Phillip H. Kennedy, Sr. shortly thereafter. Kennedy died in 1918, and in 1920 his wife conveyed the property to Henry Mead who ran it as a dairy farm until his death in 1961. The Eldred property is now in the hands of Henry’s son, Clyde E. Mead and family. The area investigated near the 1850 house yielded few artifacts documenting activities at this mid-19th-century property. Items recovered from the Eldred Site included vessel glass, cut and wire nails, milk glass lid liners, a horseshoe nail, lamp chimney glass, whiteware ceramics, a zinc jar lid fragment, and window glass. 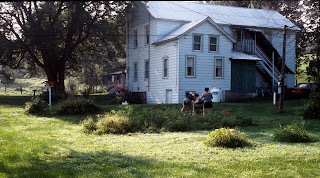 One historic site was recorded in the Pennsylvania Archaeology Site Survey files, 36Wy150, Eldred Site. Archaeologists concluded that there was no sign that significant cultural resources would be affected by the construction of the new bridge and no further investigations were conducted. While this particular site did not yield significant historic artifacts, it serves as important evidence of Pennsylvania’s commitment to identifying and preserving its cultural resources. For more information, visit PAarchaeology.state.pa.us or the Hall of Anthropology and Archaeology at The State Museum of Pennsylvania . After six field seasons the Pennsylvania Historical and Museum Commission’s (PHMC) Section of Archaeology ended excavations at the Quaker Hills Quarry (36LA1100) Site, a four acre size Shenks Ferry village located in Lancaster County, Pennsylvania. The property is transitioning from a corn and bean field to a high density residential development replete with efficient condominium size homes, lawns and paved drives. In compliance with the Pennsylvania State History Code the PHMC undertook a multi-season archaeological study at 36LA1100. The work involved a detailed surface evaluation of prehistoric resources and a broad scale data recovery within the proposed development. The endeavor provided us with a glimpse of prehistoric Indian life at the dawn of history. With the assistance of Temple University staff and students, PHMC exposed, mapped and selectively excavated more than 50% of the village site. The results provided sufficient information to determine site size, arrangement of living structures and related pit features, and other salient information about terminal Funk Phase Period subsistence and mortuary practices. How Old is the Village? 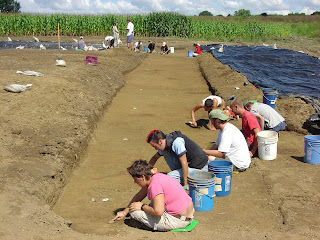 Archaeologists place the Shenks Ferry Culture (circa 1250-1550 A.D.) into the Late Woodland Period. This three hundred year range of time was principally determined by radiocarbon dating charcoal and organic residues found in association with certain artifact types at Shenks Ferry sites in the Susquehanna Valley. The age of Funk Phase sites (the latest phase of Shenks Ferry) tend to cluster around the mid to late 15th century with a few sites surviving well into the beginning of the 16th century. The majority of radiocarbon dates for the Quaker Hills Quarry Site indicate an occupation period closer to the first quarter of the 16th century during a time when the New World was undergoing many changes. Archaeologists have stated that the conspicuous correlation between the disappearance of Shenks Ferry and the arrival of the Susquehannocks may indicate inter-tribal warfare and that some Shenks Ferry settlements may have actually been overrun with invading Susquehannocks. This conquest theory has met with some challenge, however, and other reasons may have, in fact, precipitated their demise. The following images depict typical artifacts and exceptional finds recovered from 36La1100, quartz projectile points and Funk phase pottery. For more about the Shenks Ferry Culture and the results of PHMC excavations at the Quaker Hills Quarry Site please visit the research section of the PHMC's archaeology Web site. Our blogger this week is Wes Stauffer an intern for the Cultural Resources Section of the Pennsylvania Department of Transportation. Wes worked for a day in the Section of Archaeology observing our processes and auditing a Cultural Resource Management collection for compliance to our Curation Guidelines. Under Section 106 of the National Historic Preservation Act of 1966, federal projects require planning and cooperation, in addition to hard work. This proved true when the Pennsylvania Department of Transportation determined that the Bates Road/Weidner Road Bridge over Carley Brook, near Honesdale in Wayne County, needed to be replaced. Built in 1916, it had fallen into a state of disrepair over time. To insure that no important cultural sites were destroyed by the construction of a new bridge, a site survey preceded any site work. Ideally, background research as well as on-site surveys will locate any important historic and archaeological sites in the area of probable effect (or the area to be impacted by the footprint of a new construction project). Such surveys prove especially important along waterways. Waterways provide food and transportation routes today just as they did for our predecessors. Relatively level, well-drained soils adjacent to water travel routes, as well as the fertile soil in adjoining floodplains, provided prime locations for Native American camps and settlements. At the Carley Brook site, research and archaeological investigation uncovered a portion of the former Staengle property. Leonard Staengle built a house on the property around 1889, as well as a barn and a butcher shop. Staengle cleared the land and established a small farming operation to supplement his butchering business. Various occupants utilized the property through to present day. Archaeologists excavated no prehistoric artifacts from the area of probable effect. Approximately 85% of the 302 historic artifacts unearthed reflect kitchen or architectural usage. 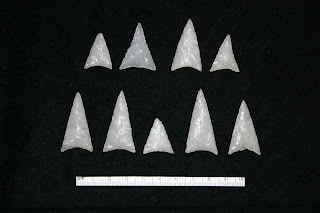 Research determined that the artifacts reveal an occupation period between the 1890s-1920s, however they were uncovered in a mixed or disturbed context. Furthermore, no building foundations were located. Archaeologists concluded that a former refuse dump lies within the area to be impacted by the construction of a new bridge. 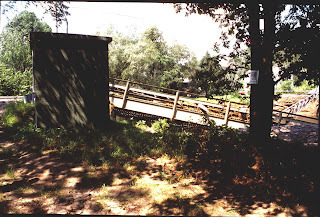 With their research completed and archaeological evidence analyzed, archaeologists felt confident that construction of the new bridge over Carley Brook could proceed without negatively impacting any important cultural resources. All artifacts, donated to the Bureau of the State Museum of Pennsylvania, have been inventoried and archived where future researchers can study them and other artifacts like them. Cultural resources management, integral to projects such as the Bridge Replacement project over Carley Brook in Wayne County, preserves our heritage and gives residents of Pennsylvania a better understanding of our state’s past communities as well as those individuals who lived and worked within them. On June 27th The Friends of Camp Security held a public program at Schultz House in Springettsbury Township, York County to raise public awareness and support for saving this very important historic site. Camp Security served as a Revolutionary War- era prisoner of war camp from 1781 to 1783, possibly housing as many as 1500 English, Scottish and Canadian soldiers along with their wives and children. 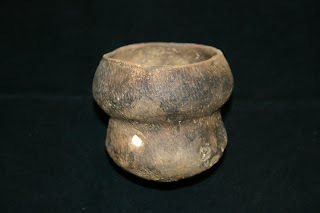 Archaeological investigations conducted in 1979 by the Pennsylvania Historical and Museum Commission (PHMC) archaeologists recovered artifacts which were linked to the occupation of the camp. The site is currently privately owned and is slated for development, destroying the only undisturbed Revolutionary War P.O.W. camp in the Nation. Archival records indicate that Camp Security housed the remnants of Burgoyne’s Convention Army regiments after their surrender at Saratoga on October 17,1777. The force was composed of both British and allied troops (Hessians, Brunswickers and Canadians) with British troops numbering in the majority. Their arrival in July of 1781 required preparations by local carpenters for the construction of huts and fences. The troops performed the actual labor of creating their internment camp under guard of York County militia. The soldiers and the families who had followed them remained here until June 1783 and engaged in “mechanical trades” in the surrounding communities. These trades reportedly included making lace, spoons, and buckles. 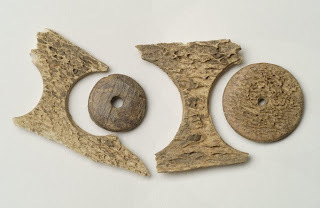 Archaeological evidence suggests they were also producing straight pins and bone buttons.